I am a lucky lady. 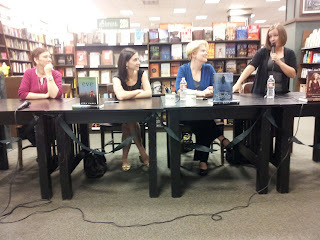 I got to chat with Kiersten White, Amy Garvey, Anna Carey, and Claudia Gray before their signing at the Huntington Beach Barnes & Noble as part of the Pitch Dark Books tour. Unfortunately, Allison couldn't make it so it's all me today folks. This was such a fun interview! These books are all SO awesome and unique. There was so much to talk about! Well you already get enough of me in the podcast, so I'll be quiet now and get this show on the road. Would you like to download this podcast? Click here for a mp3. Thank you to the audience members who participated! We love having you on the program. 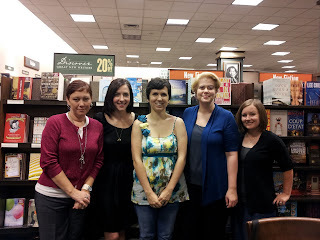 Please feel free to approach us if you see us at book signings. (We'll be the ones walking around with a mic.) We'd love to hear your thoughts and get you "on the air". 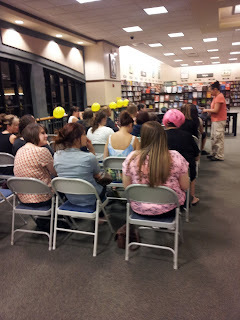 Also, thanks again to the wonderful Huntington Beach Barnes & Noble for accommodating us. You guys are great! Stay tuned. There may just be a giveaway coming up related to this podcast. So listen and stick around, okay? Hosting courtesy of archive.org. Intro music by 46bliss. Our special edition song choice is Lavender by Eric Wilson. Be sure to subscribe to Authors are ROCKSTARS! via iTunes.